A regional Russian official was recently expelled from the ruling United Russia political party for recording a bizarre workout video at the workplace – a creepy funeral parlor – and posting it on her Instagram account. You can say that she gives the phrase ‘dying to lose weight’ a whole new meaning. Anastasia Myakina was head of United Russia’s faction in the Shelekhovo District Assembly in the Irkutsk Region, as well as the manager of a state-owned local funeral parlor. Until recently, she was considered a successful business woman in her home town, but then she made the grave mistake (pun intended) of recording a short workout video at the workplace. 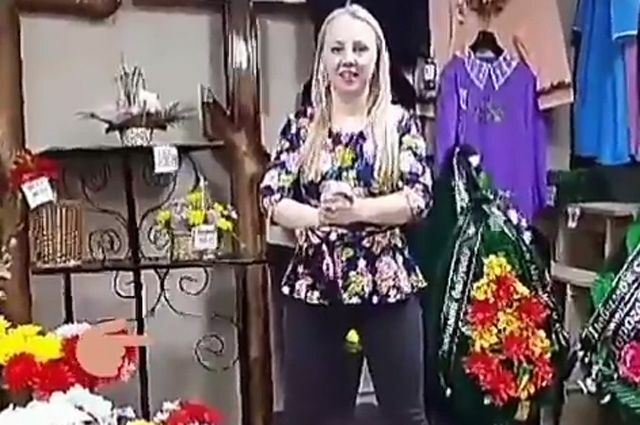 In the bizarre footage, which has gone viral online, she can be seen smiling as she squats in front of the camera, with tombstones, funeral caskets and wooden crosses in the background. It turns out that 24-year-old Myakina had signed up for a popular weight-losing program that involved doing exercise every day wherever you are, and sharing the video with other people in the program. She probably thought she’d score points with her peers for exercising in such an extreme location as a funeral parlor, but after her video went viral, most people were infuriated by her audacity. Even trainer Vasily Smolny, who started the online fitness movement that the ex-politician was involved was quick to condemn her actions. “Surgeons shouldn’t do it while operating on patients, coroners during autopsies, priests while conducting mass, firefighters when extinguishing fires etc.,” Smolny said, adding that he will probably write down some guidelines for professionals who want to train at work, so that this sort of thing doesn’t happen again. Following the negative feedback she received for her video, Anastasia Myakina deleted it from Instagram, but it had already been reposted on YouTube for everyone to see. She later tried to justify her actions. “I do not know much about technology, so I did not think that this video would be available to the general public. Now I do not know what to do, I can be fired,” she said in an interview with Life.ru. Unfortunately, the leaders of United Russia were not impressed by her explanation and kicked her out of the party. “Anastasia Myakina’s behavior in the workplace that violates all common moral standards and was an unpleasant surprise. It is simply unacceptable. I believe that the local political council made the right decision, one that represents the opinion of all party members,” said Svetlana Bragina, head of the executive committee of Irkutsk’s regional branch of United Russia. Myakina later posted another video in which she apologizes to Vladimir Putin and her former party for the embarrassment she has caused them. “Dear Vladimir Vladimirovich, dear Russians, I am very sorry if I insulted you with my video, I did not mean to,” she said.